It’s nearly Christmas and news of mugging inside taxi cabs, sometimes even by the driver himself, scared the heck out of sis and me. Usually, when sis goes shopping alone, she rides a taxi to and from our house. But two sundays ago, Sis asked me to fetch her from SM North EDSA after she’s done shopping. In exchange, merienda (afternoon snack) is on her. 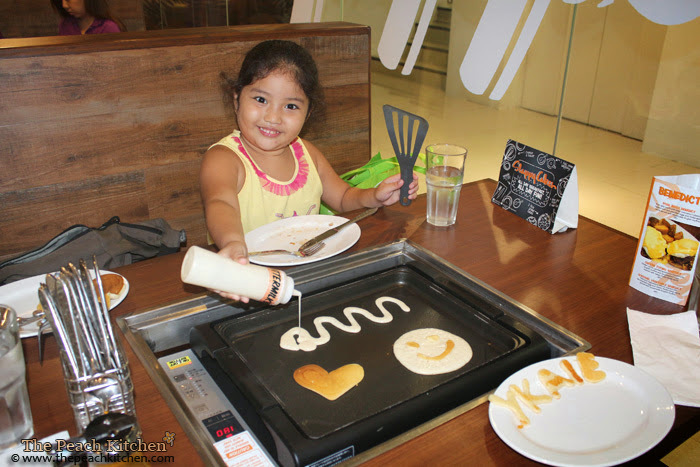 Our pancake-lover kid foodie, asked if we could try Slappy Cakes since we haven’t tried eating there yet. Sis agreed. As per my research, Slappy Cakes is one of the most popular breakfast spots in Portland, Oregon mainly because of the interactive setting that they are offering. Guests will have a one-of-a-kind dining experience as there are griddles built into each table, giving customers the opportunity of cooking their own pancakes right at their table. Add some toppings. You can choose between sweet toppings like: Pure Honey, Creamy Peanut Butter, Lemon Curd, and Apple Sauce. Or you can also choose from savory ones like : Crispy Smoked Bacon, Crumbled Sausage, Spanish Chorizo, and Smoked Ham. If you don’t like to create your own combination, they also have some flavor suggestions in the menu. We chose Buttermilk pancake batter, Crispy Smoked Bacon for the fixin/topping, and Lemon Curd as another topping. 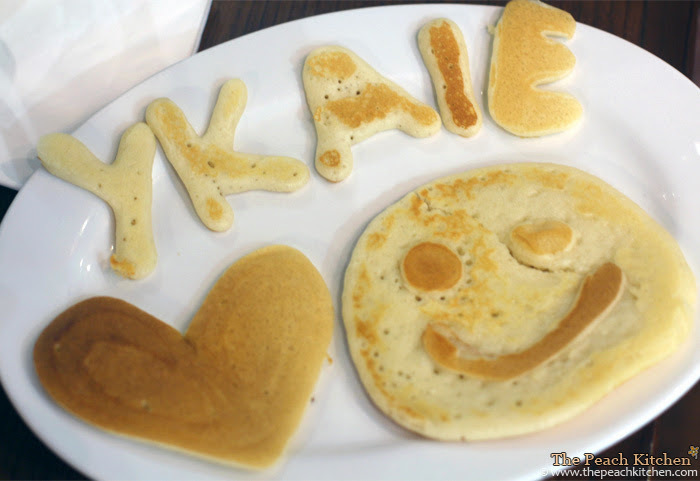 Then we let Ykaie doodle her way into her pancakes — with our help of course! She even tried to create different kinds of shapes. It would’ve been a lot more fun if we had a different colored/flavored pancake batter because we could’ve created more shapes but there are only three of us and I knew we won’t be able to finish it. 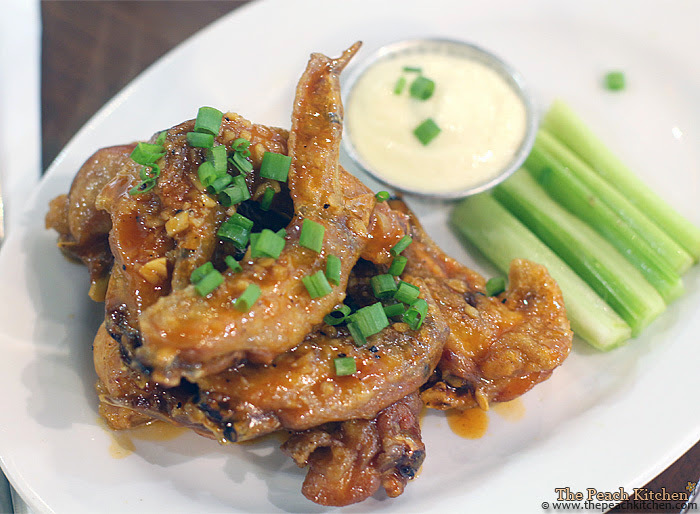 Aside from the pancake, we also had some Buffalo Wings. The chicken pieces were kind of small but I love how garlicky their sauce is! 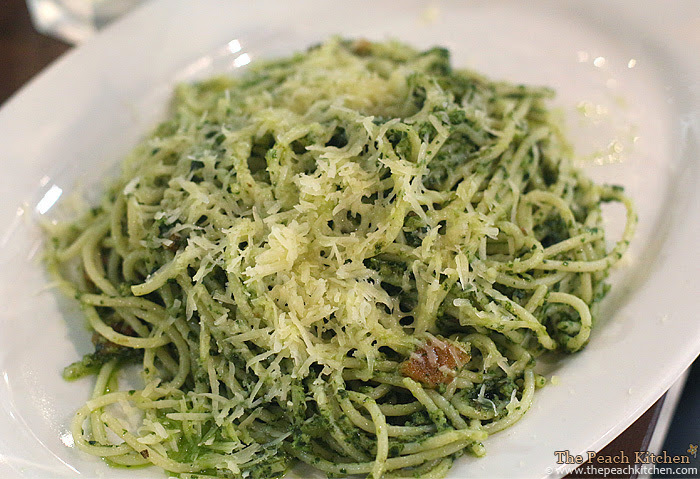 Ykaie also ordered for Pesto Spaghetti. It says on the menu that theirs was made with cashew nuts. It tastes just like how a delicious pesto should taste like but the sauce is a little overkill. There was too much sauce. It’s not a problem with me because I like my pasta that way —smothered in rich tasty sauce. Ykaie loved it that way too but sis didn’t. It was way too much green for her. Sis also ordered a bowl of French Onion Soup which was served really hot! This is how soups should be served and this is how we like it. 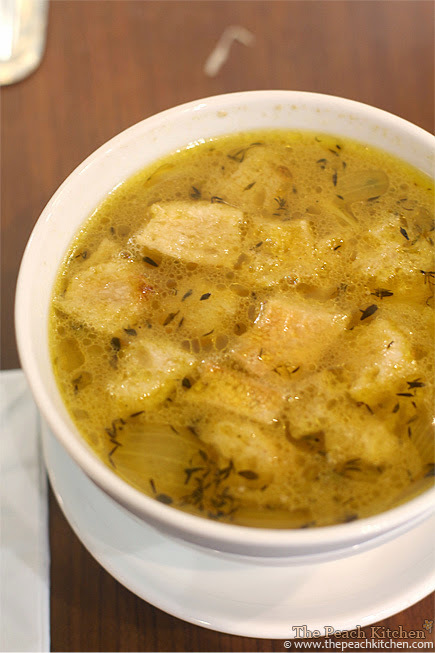 The soup is a mixture of sweetness and salt but somehow I was looking for that sweetness that only well-caramelized onion could give. We were also looking for the sticky cheese which we found later on the bottom of the bowl, not gooey and its perfectly sliced shape still intact. 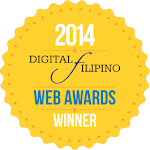 It was still a wonderful experience and the staff were friendly, helpful and attentive. Sis even left her phone at the restaurant and when we called, a polite staff answered us. We got it back after a few minutes. A big THANKS to Slappy Cakes! Fun to make and eat waffles! We went there for my best friend’s celebration sometime last June (Eastwood Branch). It was awesome and fun! But we were only able to try the pancakes, we even ordered the chocolate flavor for the pancakes. It was so fun and we were so full of pancakes in our tummy haha. I got to agree, the staff there are really friendly, they will even teach you how it works and consider you for being first timers) I wish I can go back there again! I wanna try that, too! 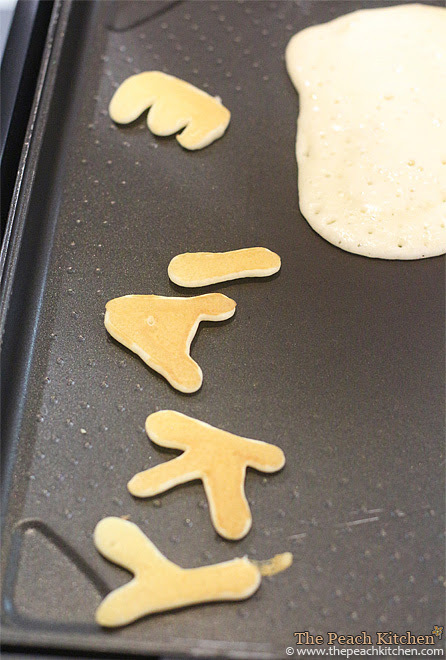 Designing my own pancake sounds wonderful — oh i am feeling the child in me. lol! 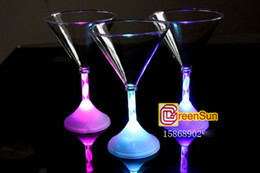 surely me and daughter would enjoy this. Damn. I wish I can grab a bite there – it seems so yummy and fun too! Awe! What a fun place to dine. 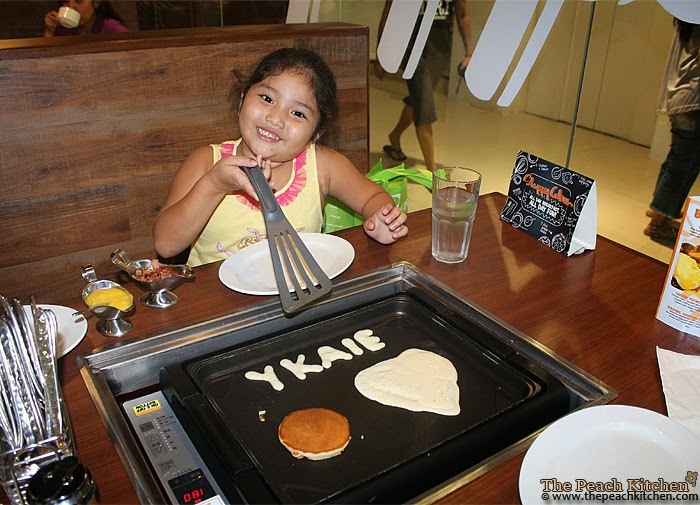 I love, love, love the DIY pancake because the kids will surely have fun like Ykaie. 🙂 Thanks for sharing! This made me want to try dining in Slappy Cakes. The nearest place in my home is in Eastwood.